Southall was born in Nottingham of Quaker parents, and was taken by his mother to Birmingham when his father died the following year. In i874 he entered the Friends' School. Bootham, where he was taught painting by Edwin Moore (brother of Albert and Henry). Four years later he joined the Birmingham firm of architects, Martin and Chamberlain, but in 1882 he left to concentrate on painting, attending the Birmingham School of Art where he met A J Gaskin, henceforth his closest friend, and other members of the Birmingham Group. About the same time he set­tied at 13 Charlotte Road, Edgbaston, his home for the rest of his life. In 1883 he spent eight weeks in Italy, absorbing the early masters, and on his return he began to experiment with tempera. Meanwhile, through an uncle, he had made the acquaintance of Ruskin, who commissioned him to design a museum for the Guild of St George at Bewdlev (1885); this came to nothing but took him again to Italy. He also received encouragement from W B Richmond and Burne Jones, to whom he paid visits in London (1893-7). In 1895 he began to exhibit at the RA (Car. 72), showing there till 1942, while also support­ing the New Gallery (1897-19o9), the RBSA (Associ­ate 1898. member 1902) and the Arts and Crafts Exhibition Society shows (1899-1923). 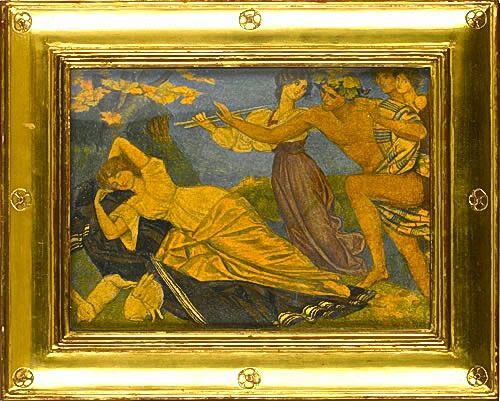 In 1901, together with J D Batten, Walter Crane and others, he helped to found the Society of Painters in Tempera, and he was undoubtedly the single most important exponent of the tempera revival. Though never, like so many members of the Birmingham Group, on the staff of the local Art School, he gave lessons on tempera painting in his Edgbaston studio and lectured on the subject widely. As well as literary figure subjects, he painted genre scenes, portraits and landscapes; his wife Anna Elizabeth, a first cousin whom he married in 19o3, appears in many of his pictures, and often helped to decorate their elaborate gilded frames. Southall was a leading figure among Birmingham Quakers, a Socialist and pacifist; he campaigned vigorously against the conduct of the Great War, during which he painted the fresco of 'Cor­poration Street, Birmingham, in March 1914', on the stair­case of the Birmingham Art Gallery, (completed in 1916). In later life he joined the NEAC and RWS (1925), participated in joint exhibitions with other Birmingham and tempera painters, held a number of one-man shows (notably at the Alpine Club 1922), and, building on the success of an exhibition at the Galeries Georges Petit in Paris in 1910, established a considerable inter­national reputation. He and his wife paid frequent visits to Italy, sometimes with Charles and Margaret Gere; also to France, Southwold and Fowey, where he found many subjects. In 1933 he was appointed Professor of Painting at the RBSA (President 1939), and in 1937 began a fresco in the Council House. It was not, however, completed; that August he under­went a major operation and never fully recovered, dying in 1944. A memorial exhibition was held at Bir­mingham, the RWS and Bournemouth the following year.